Re-post from Cincom Corporate Blog about RFP requests. I remember one beautiful Friday afternoon many years ago. It was one of those Fridays that seemed to stretch out over an eternity of time. It wasn’t particularly busy, which in a way made it worse. I was excited and counting off the minutes ‘til five o’clock. It was early spring, and I was heading out that evening to meet some old friends for a weekend trip to a distant state park and trout stream for opening day of trout season. The weather forecast was perfect, the beer was on ice and the licenses and tags were all purchased. It was precisely 4:48 p.m. The phone rang, and I actually debated about just letting it ring. I picked up the phone and answered. It was one of our field sales reps. There are a lot of considerations in situations like this, but it really boils down to one very obvious fact: You will never get the business if you don’t respond. You may be last-minute column fodder, and you may be the fourth to fill out a quorum in a three-way shortlist. The fact is, if the product fits, you must respond. Many companies have depended on a ruined-weekend strategy in situations like this. Last-minute request-for-proposals (RFPs) trigger activation of a team of people who are willing (some more so than others) to drop everything else (personal and professional) and get the response assembled and out the door. No doubt, many trout are grateful for this approach, but businesses, customers, investors and the rest of us can do better. Technology can help, but you also need to review processes and be aware that customers buy differently than they used to. In some ways, customers are way ahead of sellers in this area. It is becoming more and more common for companies to do their own research about new products and alternatives without any one-on-one communication between buyer and seller. First of all, your RFP response folks should almost never be surprised like this by internal requests for help with RFPs. Visibility into your sales channel will help you find the RFPs sitting in the sales inbox before the rep even knows they are there. In this area, technology offers great help. Guided selling ensures that a ready supply of useful, accessible content, matched to the buyer’s specific needs, will be available to the buyer with a minimal investment of some useful data. Marketing utilises content as product and information/data as currency in the guided-selling world. Curious, serious potential buyers are encouraged to look at all manner of useful content, matched to a specific level of interest and gated with data requirements tied to the relative value of the content offered.s This activity should be monitored and scored to classify how serious the visitor, downloader or reader is. Rather than dialing up a sales rep, customers and prospects visit the vendor sales portal for additional information about products. Data sheets, customer stories, brochures and other collateral are made available via the portals. In many cases, RFIs are simply not needed because the questions are all answered effectively within the customer portal. Sales portals offer inward gateways for prospects and customers, but for Marketing, they offer visibility into the sales channel via a panoramic window onto prospect activity and interest level in specific products. 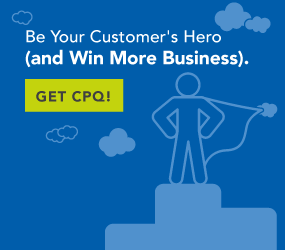 Within the customer portal, CPQ provides the technology for an e-commerce solution to help design and build a product solution that most effectively addresses the needs of the customer. Scripted interviewing questionnaires are answered by the customer, and those responses drive the selection of base models, options and necessary add-ons to fill out and complete an offering matched to individual needs. When the time comes to talk price, the portal can provide a price quote or a full-blown proposal. Regardless, an accurate price is generated covering all of the necessary parts and options for the product solution being quoted. Automated proposal generation means you can take that last-minute RFP and turn it around within an hour. The customer’s needs are satisfied better than ever, your sales team is able to provide a flawless proposal in minimal time and your product is spec’d and priced perfectly in a format that helps you sell. You make your competitors look ham-handed and ineffective. Your weekends are no longer threatened. The trout are no longer safe.